Wildlife managers have culled more than 1,100 bison from Yellowstone National Park, according to the Bozeman Daily Chronicle. 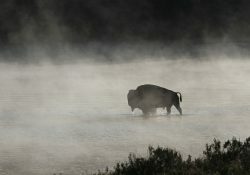 The Chronicle reported that 1,155 bison were removed from the herd. That surpasses the 600 to 900 animals officials agreed to over the winter. The park’s bison population will total about 4,300 animals after the spring calving season. This is the first time since 2012 the population has dipped below the 4,500 animal goal. Officials aim to continue to reduce bison numbers in the park. A multi-agency agreement calls for the number of bison to be reduced to fewer than 3,000 animals, according to the Chronicle.